Nicolas Schöffer (Kalocsa, Hungary 1912 – Paris, France 1992). Nicolas Schöffer. He was one of the main promoters of artistic space in post-war Europe and a forerunner of “cybernetic art” and media art. His research, focused on the programming of time, light and space, marks a decisive break from the art of the twentieth century. In his work sculpture frees itself from the materiality of the object, to become a device that generates effects on the spectator, in a spirit of total art. 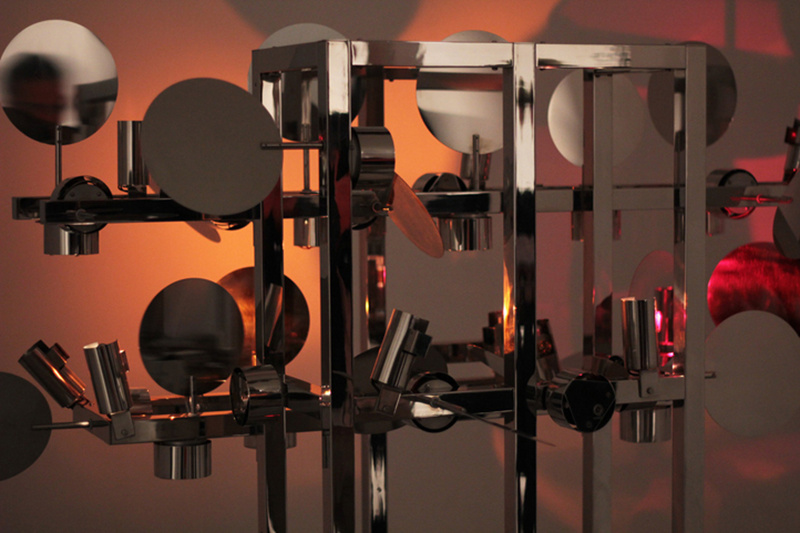 Schöffer is also known for connecting art with technology by providing his sculptures with ͚electronic brains͛ responsible for feedback systems. The sculptures of a new kind were able to interact with humans and the environment. In his artwork, for the first time, it was possible to replace the man in a ballet performance with a robot, and control a monumental sculpture with a computer. (Tour de Liege, Tour Lumiere Cybernétique de la Defense) Schöffer received his artistic training at the School of Fine Arts in Budapest and the École Nationale Superieure des Beaux-arts in Paris. He moved to France in 1936. In 1948 he began to investigate Spatiodynamisme through the construction of a series of sculptures made of aluminium frames and glass or Plexiglas coloured slates (in some cases mobile) which particular design and structure produced dynamic changes of both, the internal spaces of the pieces and their environment, multiplying the effects of light and shadows. His sculpture ͚CYSP 1͛ (1956) is considered as the first cybernetic autonomous sculpture in art history. To create this work, Schöffer used an electronic system developed by the Philips Company. His creative-innovative career includes painting, sculpture, architecture, urbanism, spectacles, tapestry, films, music, videos, teaching and 10 books. – 1,000 m2 of Desire Architecture and sexuality, CCC Barcelona, 2016.